In my last post I promised more on the Holy Sepulcher and the Holy Grail and their relation to an Easter catechesis and the tradition of chivalry. There is much there to reflect on, much to be researched and assimilated, so it will take at bit more time. Meanwhile, however, I thought I would point out that in the Office of Readings this week we have been reading from the the Jerusalem Catechesis, or otherwise known as the Catechetical Lectures of St. Cyril of Jerusalem (+386). The Catechesis consists in twenty-three lectures, the first eighteen of which were delivered to the candidates for baptism during Lent and the last five to the newly baptized during Easter, and is an excellent example of the mystogogia. In fact, at the end of the prologue for Lectures St. Cyril makes sure his readers understand that his instructions are only for those whose Baptism is imminent, and is to be seen neither by the other catechumens nor heathens. St. Cyril admonishes the candidates for Baptism to shun all “secret hypocrisy,” in order to be fit for the Lord’s true service. He compares the penetration of our souls by the judgment of God to a military review of recruits by one who levies for war. He bestows his seal only upon those in whom He discerns a good conscience, in view of which the devils tremble and the holy angels recognize. St. Cyril says: “You are receiving not a perishable but a spiritual shield. Henceforth you are planted in the invisible Paradise . . . it is God’s to grant grace, but yours to receive and guard it. Despise not the grace because it is freely given, but receive and treasure it devoutly” (Lecture 1, 3-4). This is even before Baptism, hence prior to the mystagogia, but the saint is already admonishing the new recruits to be prepared for war and especially to to protect the paradise of their own souls. Consider therefore the Bread and the Wine not as bare elements, for they are, according to the Lord’s declaration, the Body and Blood of Christ; for even though sense suggests this to you, yet let faith establish you. Judge not the matter from the taste, but from faith be fully assured without misgiving, that the Body and Blood of Christ have been vouchsafed to you (Lecture 22, 6). But he goes beyond the content of the doctrine and emphasizes to the newly baptized that the Eucharist has been prepared for those who have been anointed by the Lord, and thus they have been sealed against the afflictions of the evil spirits. The Lord has set a “mystical and spiritual Table,” in opposition to table of corruption set against us by the enemy. Our hearts have been strengthened, he say,s and the “face of our souls” made to shine. And your cup intoxicates me, as very strong. You see that cup here spoken of, which Jesus took in His hands, and gave thanks, and said, This is My blood, which is shed for many for the remission of sins (Lecture 22, 6-7, 9). And these things were done in the outer chamber. But if God will, when in the succeeding lectures on the Mysteries we have entered into the Holy of Holies , we shall there know the symbolic meaning of the things which are there performed. Now to God the Father, with the Son and the Holy Ghost, be glory, and power, and majesty, forever and ever. Amen (Lecture 19, 11). We are not only searching, but we have already arrived. We are in an in-between time, indeed. O Lord our God, may we be healed now and forever by these sacred rites which You instituted to protect us in our new life of grace. We have entered into the Holy of Holies, and that sanctuary is the Heart of Christ, whose mercy and grace is poured out as blood and water from His side. 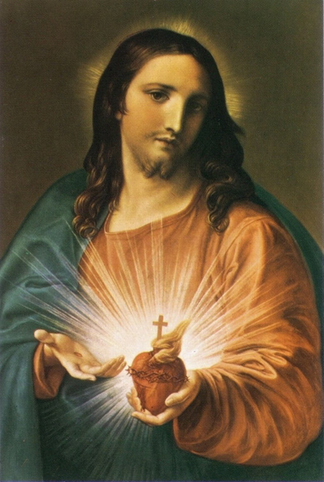 We are healed and protected in Him, and in the Heart of His Holy Mother. The true knighthood of Christ is the protection of these mysteries, first of all within our own Hearts. That ultimately is the meaning of the crusade for the Holy Sepulcher and the Quest for the Holy Grail. More on this next time. This entry was posted in Blessed Virgin Mary, Catholicism, Chivalry, Culture, Knaves, Knights, Literature, Marian Chivalry, Prayers, Religion, Spirituality and tagged Baptism, Easter, Easter Triduum, Eucharist, Holy Grail, Holy of Holies, Holy Sepulcher, Holy Week, Jerusalem Catechesis, Mystagogia, St. Cyril by Fr. Angelo M. Geiger. Bookmark the permalink. I’ve always disliked that painting. Thanks, Jeff. I am glad it helps. It is actually not my favorite either, but I thought the Heart in hand was illustrative of the post. I am finally getting a moment to read through some of these articles that I’ve been unable to read over the last few months. This one is quite good though it leaves me with questions. I love this phrase: ” it is God’s to grant grace, but yours to receive and guard it”. I think it’s where our Protestant family members miss the mark .. we do have to take some part in our salvation, though it is agreed that we surely cannot do it on our own and our part is quite minimal compared to God’s part. (Nor do we deserve it, etc) However, I really do hope that Our Lord helps us to guard it because I fear I cannot do that quite adequately either. The following quote puzzles me : ” …and thus they have been sealed against the afflictions of the evil spirits. ” I don’t always feel sealed against Satan’s evil afflictions. Do you? In fact, this would be more appreciated by some of our Protestant brothers and sisters who claim that once saved, always saved. But, as Catholics, we believe that we can indeed lose our faith and our salvation. So, this comment confuses me. Probably I am missing something, as always. As always, thank you for continuing to prod our minds and hearts for the Truth. In this life we are never entirely immune to our enemy, but the Sacramental life, especially the Eucharist, is our protection. If we want to be protected and act accordingly we will be.